Welcome to WAM Studio! 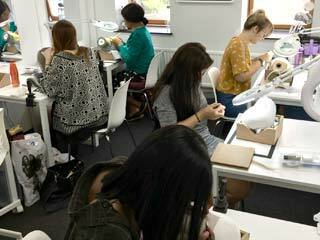 We offer the most comprehensive range of short courses in Wig Making in London. Our courses are designed for both the complete beginner and industry professionals alike and allow you to learn the complete range of wig making skills, from preparing a client’s head to knotting complex partings, at a speed to suit you and to fit around your current work commitments. Many of our course dates are at weekends to allow busy professionals the opportunity learn these fun, rewarding and valuable skills, and all in the comfort of our lovely studio in Peckham. 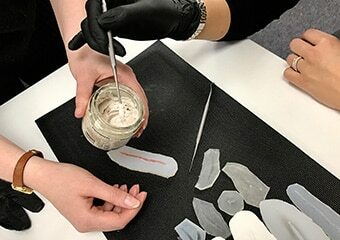 WAM Studio also offers a range of SFX makeup courses for complete beginners or those wanting to brush up their skills. The Wigs and Makeup Studio is run by Corinne Young and Philip Carson-Sheard both industry professionals working full-time in the business. They have a wealth of experience ranging from work at English National Opera, the Royal Shakespeare Company, Glyndebourne and West End productions to film and editorial make up and teaching wig making and wig dressing at various prominent colleges. 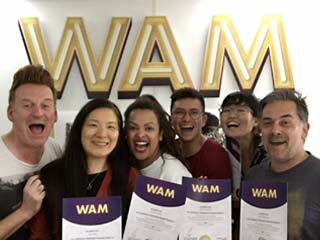 WAM Studio is run by Corinne Young and Philip Carson-Sheard who have a wealth of experience ranging from work at English National Opera, the Royal Shakespeare Company, Glyndebourne and West End productions to film and editorial make up and teaching at various prominent colleges. These short and affordable courses are intended to cater for a broad spectrum – for beginners who are interested in developing certain skills, industry professionals who want to expand their knowledge and skills and students who want to build on their previous training. WAM Studio has designed these short but comprehensive SFX courses to appeal to make up artists wishing to build on their existing skill sets.Each course will offer tutorials, demonstrations and intensive practical workshops for students to practice, develop and refine their skills. "This is a dream come true for me and I cannot wait to use my new skills to make beautiful wigs." "I attended my first wig making class with the @thewigsandmakeupstudio in Peckham. Today we learn't how to 'Whip' which is a stitch that connects lace foundations, pleats, darts and repairs. Thanks to @philip_wigs_and_makeup for his enduring patience! More to come! Exciting!" "Great day, we crammed in so much. Just got to get the practice in now. I spend almost as long travelling as in class but it is well worth the trip. See you soon." "I'm so glad I finally know how to do this. No longer feeling out of the loop. Thank you @philip_wigs_and_makeup had such an amazing time."